Some great onboard footage from Chris Wren's brand new Firefly 850 Frequent Flyer racing in the St Helena Cup at Manly Queensland. Looks like Chris and his crew had some great fun. Here is some onboard footage of how the race went down. North QLD boys ripping it up in Thailand. 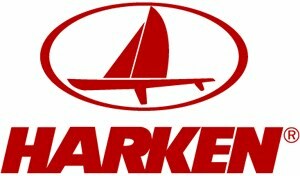 Team Harken sailors Mick Guinea & Viv Hayden are the Thailand F18 National Champions. AFTER defying a dodgy boat and giant storms for a Thailand triumph, Michael Guinea and Viv Haydon have sent an ominous warning to their sailing rivals. 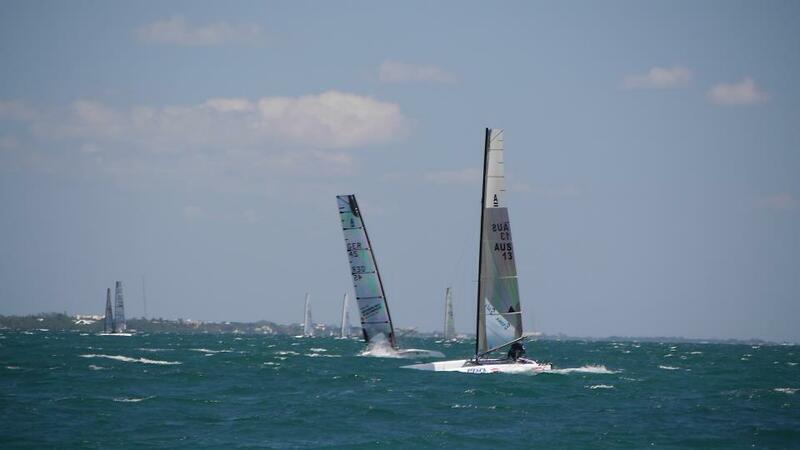 The Townsville duo could not have started their preparations for a whirlwind month of title defences - including their Australian F-18 Nacra crown - much better after clinching the Thailand National Championship last week. By winning that, Guinea and Haydon were also awarded the annual Varuna Cup. Given that they were on a borrowed boat that required "plenty of work" and that major storms cancelled two races, Guinea could not have been happier. "It's good because you can get yourself into a bit of a rhythm," said Guinea, who along with Haydon is also the reigning Queensland champion. "Sailing in different waters against different people (and) that time on the water and practising manoeuvres, that's where that is valuable." 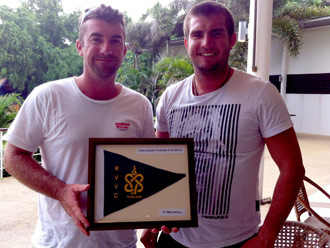 More than anything, winning in Thailand proved that long-time crewmates Guinea and Haydon still function well under pressure. 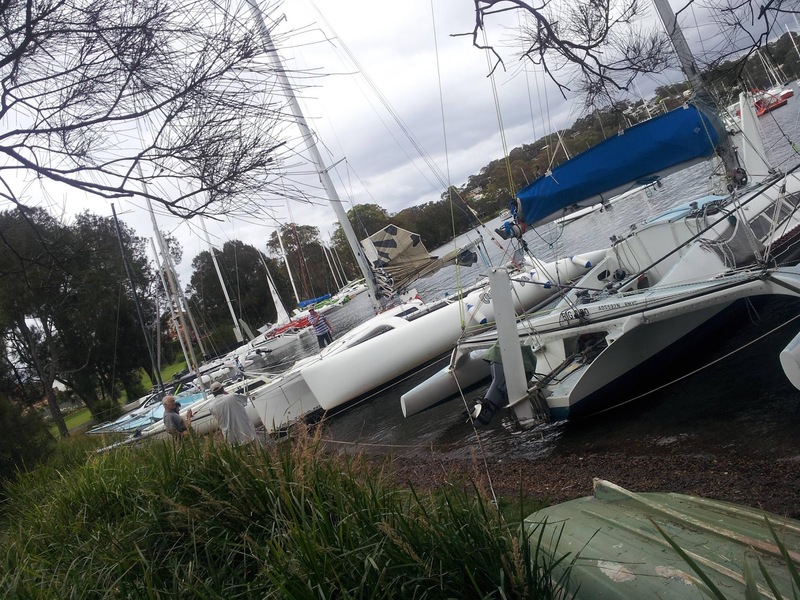 Despite claiming the first two races at the two-day regatta, an infringement penalty in the third race meant they had to clinch the fourth and final or kiss the title goodbye. But the North Queenslanders held their nerve, winning by about 30 seconds. "We just had to beat this one other guy, so we just turned it into a match race," Guinea said. "If he tacked, we tacked with him and covered him all the way around." It capped a massive 12 months for the pair, but Guinea said the hard work was only just beginning. 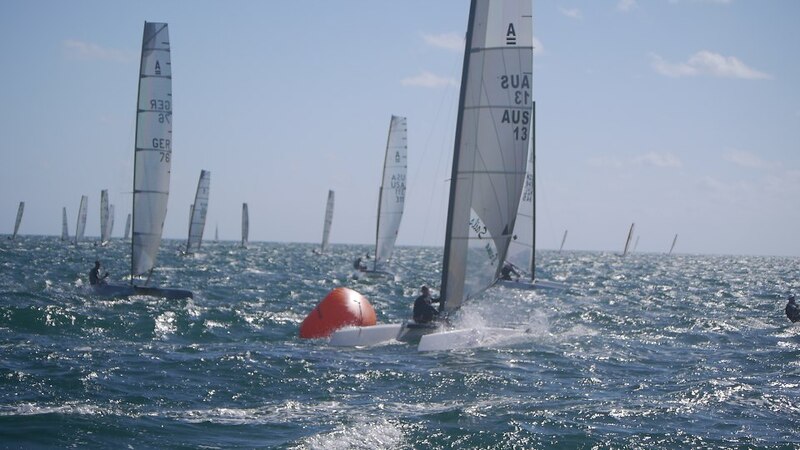 "We've had a really good year, winning the state titles as well, and a few other regattas along with the regatta in Thailand, so it's been good, but we obviously want to defend the (Australian) title as well," he said. 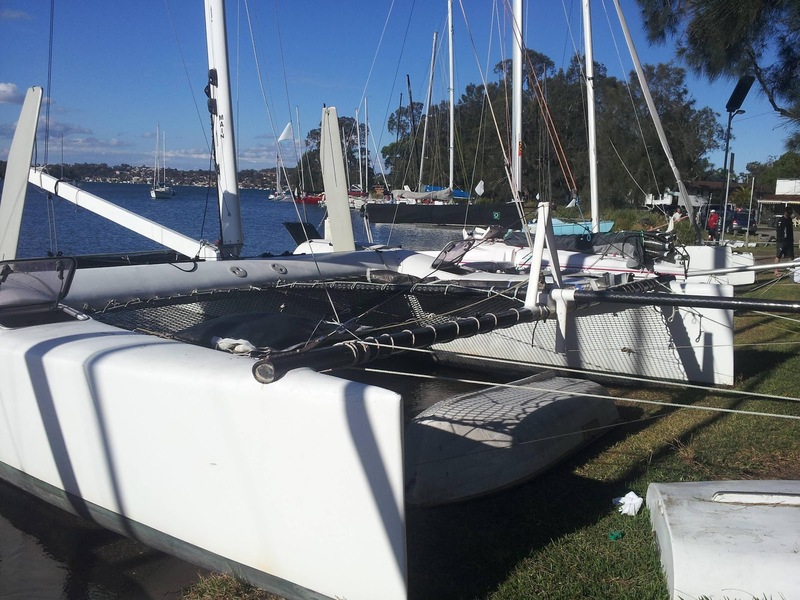 That starts for Guinea and Haydon at the end of the month when they attempt to defend their Nacra National title in Hervey Bay. 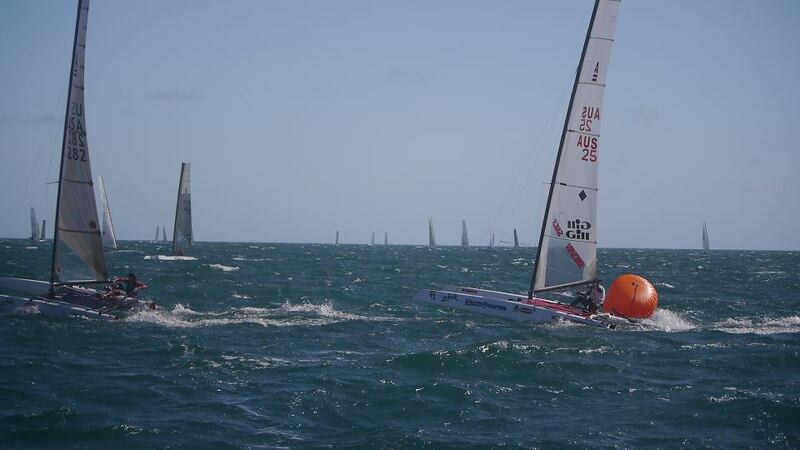 That is followed by the F18 Nationals in Newcastle and then the Nacra World Championships on the Gold Coast. The World Championships are set to take place at Travemuender, Germany. The tentative dates scheduled would be 19-28 July 2013. These World Championships would be a bring-your-own-boat world championships. The IHCA thought it was important to give as much advance notice as possible so sailors could plan their holidays and begin to organize transport of their boat. The IHCA has not yet finalized the necessary contracts for the events but is only waiting for ISAF approval for the World Championships. Stay tuned for more information. 2012 APC Logistics Multihull National Regatta are currently underway at Wangi Sailing Club in NSW. A great fleet of multis have turned up for the event from Australia wide. 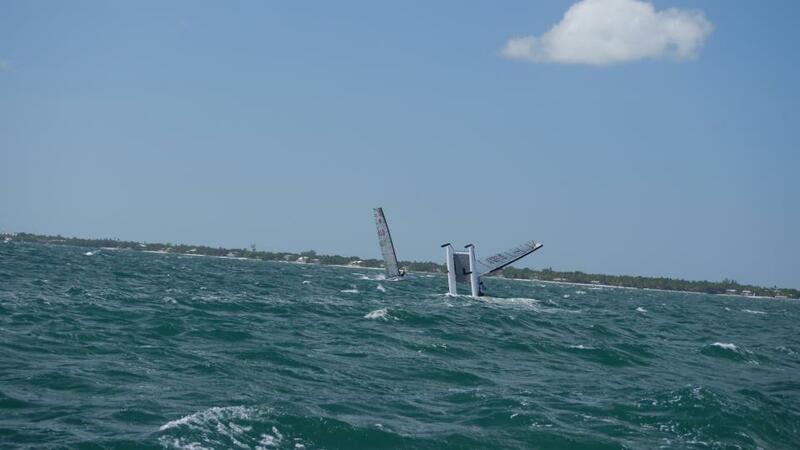 Three races have so far been run in a good 18-20kt E and SE breeze. The strong breeze has seen a couple of breakages mainly the mast on Bare Essentials. Foxy had a ream beam break but sorted a new one for the following day. The 2012 A Class Worlds were a big breeze event (totally the opposite of what I thought they would be) but with what mother nature threw at the organizers they did a great job to get the event run. All the Aussie & Kiwi boys did us proud and pretty much took over the top ten. Team Harken also did us proud coming away with a win by the crazy man from Dutch land Mischa Heemskerk, the newly crowned World Champion. Mischa is a great sailor and just loves it, no matter the wind strength he is ready to take it on. Ride that pony I say! Jack Benson, riding that pony! So till Takapuna NZ next year. Could very well be my first A Worlds as I'll be there. 2012 A Class Worlds Winner is? When the going gets tough the tough get going. 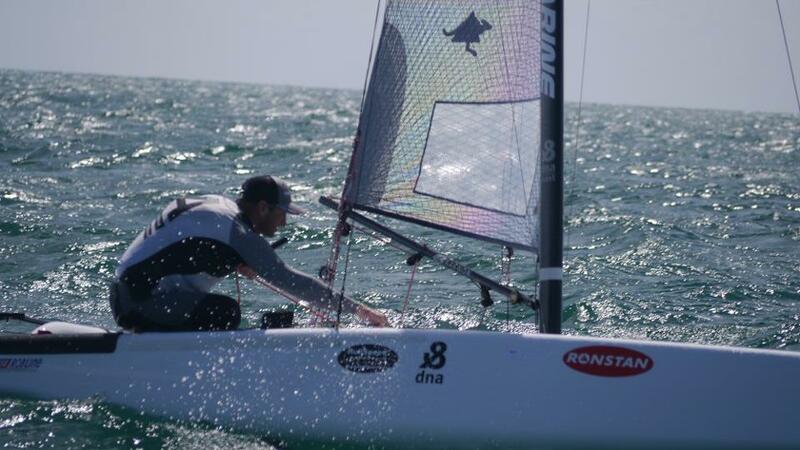 The going got tough at the 2012 Ronstan A-Class Catamaran World Championship, with extremely high wind speeds and difficult conditions throughout the week, but after five races it was Mischa Heemskerk of the Netherlands who emerged with the win. After taking a third and two seconds to put himself two points clear of Brad Collett after day one Heemskerk won both races on Wednesday to take home the championship. 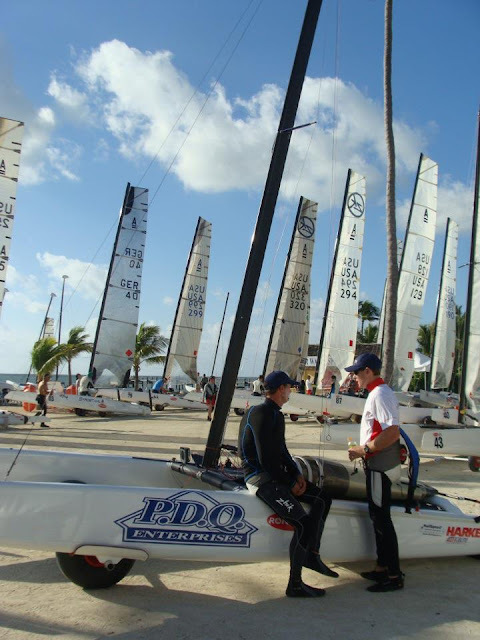 Regatta organizers were skeptical that they could get the five races required for a World Championship in after day two was abandoned and with Hurricane Sandy parked off of Cuba, so on Wednesday PRO Billy Richnow moved the first warning signal up to 9 a.m. in an effort to squeeze two races in before the breeze fully turned on. Heemskerk, Collet, and previous World Champion Steve Brewin had dominated in the heavy air on day one, but at the start of race three it was Nathan Outteridge winning the pin and holding a sizable lead at the first windward mark. Outteridge maintained his lead for two laps with Heemskerk closing on him and with Collett and New Zealand’s Murray Philpot sitting fourth and third respectively. However Outteridge and Collet both miscounted their laps and attempted to finish on the second leg, losing considerable ground and allowing Heemskerk to move into the lead. Outteridge went hard right on the final leeward leg and made a big gain, edging Philpot at the finish, but Heemskerk got the gun. The breeze built considerably in the intermission between races. 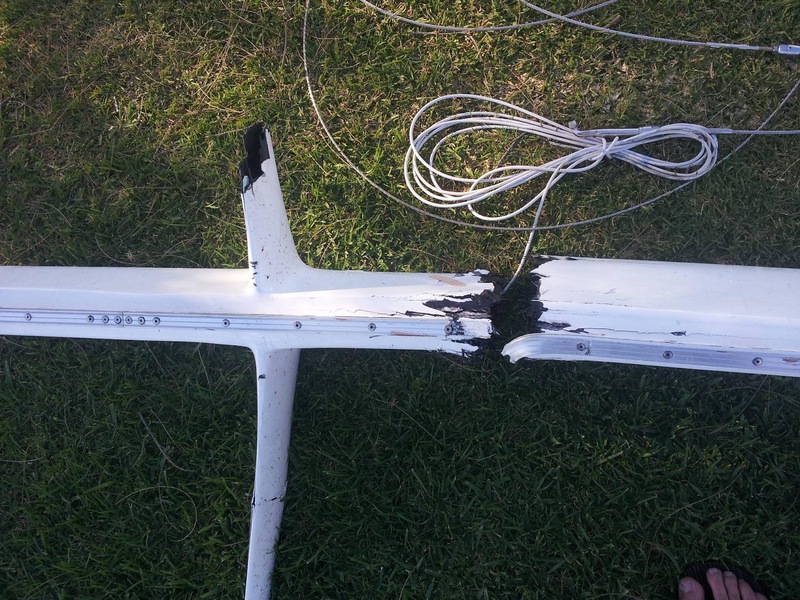 After holding at around 18 for most of race one, gusts of 24 and 26 knots were reported during the first windward leg. American Lars Guck won the pin at the start of race five, and rounded second behind Heemskerk at the first windward mark closely followed by Philpot and Outteridge. However due to the increased wind speeds the race committee were forced to shorten course in the interest of safety, finishing the fleet at the leeward mark and sending them to the beach. This caused some confusion among the competitors, and while Heemskerk was well in front and got the gun easily, Guck gybed for the leeward mark and didn’t realize his mistake until Outteridge and Philpot had got by him. Other than Heemskerk the big winner of the day was Australian Andrew Landenberger. By taking a fourth and a fifth with Collett and Brewin both finishing deep each time Landenberger moved into second place after winning the final race on day one. http://www.aclassworldchampionshipsusa2012.com/ along with links to event photos and videos. Thanks to Will Clark for the report and videos. Great job. 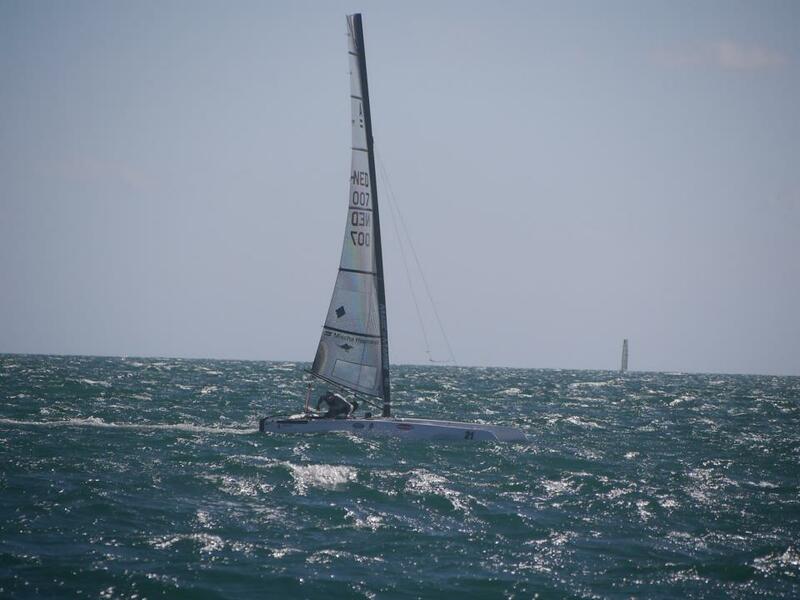 Mischa Heemskerk in the Lead after Day One of 2012 Ronstan A-Class Catamaran World Championship. Islamorada, FL (October 22, 2012) - Consistency wins regattas, and after three races at the 2012 Ronstan A-Class Catamaran World Championship Mischa Heemskerk of the Netherlands has been the most consistent sailor, taking a third and two seconds to get two points clear of Australia’s Brad Collett and five points clear of current world champion Steve Brewin. The A-Cat fleet launched today from Islamorada’s Islander Resort in winds gusting from anywhere between 15 and 20 knots, a difficulty level that spaced the fleet out considerably. 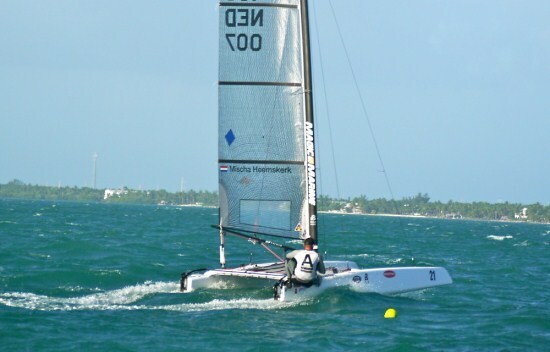 A number of sailors stayed on the beach, and a number of masts went by the wayside, but despite tight racing at the top Heemskerk emerged on top after three races. Brewin seemed to be well in command after two races. The current world champ led practically from start to finish in race one despite hitting the first windward mark and having to do a penalty circle. He was followed closely by Heemskerk with Blair Tuke taking third just ahead of Collett after port tacking the fleet with Ian Storer at the start. In race two things were more wide open, with Collett leading at the first windward mark and Heemskerk taking over the second time around. However it was Brewin who came out with the win, scooting past Collett in a photo finish with Heemskerk a close third. In race three things got more interesting. Andrew Landenberger was first around the up the initial, and led from there on to take the gun. However Brewin was close on his tail with Collett right behind him and Heemskerk deep having started at the boat – the pin was favored for most of the day. But while Heemskerk climbed Brewin had some trouble at the final windward mark, going around the offset instead of the windward mark and losing a number of boats. He eventually finished tenth, bringing his total up to twelve after three races. Collett sits second at nine with Heemskerk currently in the drivers seat at seven. The forecast is for winds to increase throughout the week and regatta organizers were pleased to get three races off, though a significant number of breakdowns did occur. American Lars Guck broke a tiller extension when he got separated from his boat on the first beat of the day and was unable to finish race one. Australian ex-pat Ben Moon’s rig came down during race two, and again right after he finished ninth in race three. Meanwhile Australians Nathan Outteridge and Steve Brayshaw both had to retire after race two, with Outteridge having lost a dagger after taking a fourth and sixth, and Brayshaw busting up his main beam after taking two fives. The fleet was very spaced out throughout the day thanks to the aggressive conditions, but very few breakages occurred after race one since most of the breakdowns that were bound to happen had already happened by that point. Heemskerk, Collett and Brewin were around the top throughout the day, but racing is still wide open, as evidenced by Landenberg getting in there in race three. Forecasts are for the breeze to keep building, and with an emphasis on boat handling anyone who can keep their boat upright and going in the right direction has a shot.